The weather was perfect for sitting out in The Landing on June 28. A decent sized crowd had gathered in anticipation of the 7:00 pm show. At 7:15 (after checking and double checking the PA system), the first band took the stage. Michael Canton, as his solo act The Goodbye Party, played a set of self-described “heavenly blues.” The Diaphone, an indie rock trio, followed. The third and final act of the night was The Beatles. Around 8:00, just as the sun was setting, The Beatles’ 1964 film A Hard Day’s Night was projected onto a screen behind where the bands had played. The delighted crowd of Lansdownians and their dogs watched the movie under the stars. This night, dubbed Open Sound, was scheduled to reoccur every other Thursday night through August. Open Sound was a hit this summer. Organized by Ramsey Beyer, Michael Cantor (The Goodbye Party), Melissa and Dave Rogel (The Diaphone), each Open Sound event featured two or three bands playing for an hour followed by an outdoor screening of a music-related movie. The bands hail from Lansdowne and Philly and span wide variety of musical genres, from punk to pop, connected by their homegrown, indie spirits. Many were sad to see the final Open Sound on August 23 (fret not – the organizers are planning to host more shows next summer, and possibly some events this fall), but fortunately it was just one of the many things to do at The Landing. 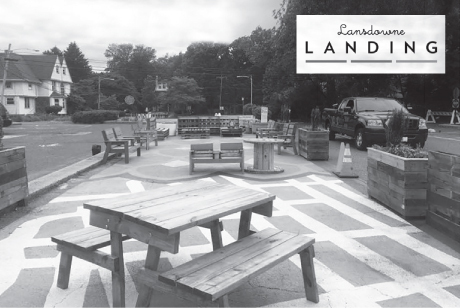 Since its grand opening in May 2017, The Landing has been a successful experiment in bringing the laid back, community public space vibes of Philadelphia’s Spruce Street Harbor Park and Clark Park to Lansdowne. The enduring staple of The Landing is the Lansdowne Farmers Market. Open every Saturday morning from May through October, farmers and merchants from near and far converge on Lansdowne, selling everything from fresh produce to baked goods to artisanal cheeses. Looking to work off the calories from everything you bought at the Farmers Market? Downtown Nutrition hosts a cardio drumming class most Tuesday nights in The Landing. And keep an eye on the calendar of events at www.lansdownelanding.com to find out when the next session of Yoga Under the Stars will be. The list of events that The Landing has hosted and will host goes on: Library on the Go hosted by the Lansdowne Public Library, the 125th Anniversary Night Market, Dîner en Tie Dye, the Tree Lighting Ceremony, Quizzo Night. The best thing about The Landing is its open-source nature; if you can’t find an event you like there, host it yourself! You can request a permit to host an event at The Landing for up to 75 people for the reasonable price of $0.00. The Landing was created by local volunteers who donated money, painted the colorful mural, and built all of the furniture and planters. Now The Landing relies on local volunteers to dream up ways to utilize the space. So how will you enjoy The Landing this fall? You could organize a food truck festival there. You could host a pet parade there. Or you could even just enjoy a lowkey picnic with some close friends and a bottle of wine there. Did I mention The Landing is a sanctioned BYOB space? It doesn’t get much better than that.